Christian Johann Heinrich Heine (born as Harry Heine 13 December 1797–17 February 1856) was one of the most significant German poets of the 19th century. Heine was born into an assimilated Jewish family in Düsseldorf, Germany. His father was a tradesman. After his father's business failed, Heine was sent to Hamburg. His uncle in Hamburg was a very successful banker, so Heine started learning his business, but he droped it later on. Then Heine started to study law at the universities of Göttingen, Bonn and Berlin, but he was more interested in literature than in law. He took a degree in law in 1825. At the same time he had decided to convert from Judaism to Protestantism. This was necessary because of the severe restrictions on Jews in the German states. Only Christians were allowed to have certain businesses or to be clerks of the state. Jews were also forbidden to become university professors, which was a particular ambition for Heine. Heine himself said, his conversion was "the ticket of admission into European culture". 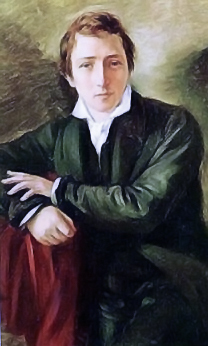 Heine is best known for his lyric poetry, much of which was set to music by lieder composers, esp. Franz Schubert and Robert Schumann. This page was last changed on 16 November 2017, at 11:38.